If you are lucky enough to attend a symphony concert in your area, there are three elements that will determine how great that experience will be. First and foremost, the scores of the pieces that you are about to hear, and the composers of those scores. Without the music from one of the great masters, there would never be any symphony concerts to attend. Second, of course, is the orchestra. The individual members of that orchestra and the orchestra as a unit. We are lucky in Houston to have one of the great orchestras of the world in my opinion-The Houston Symphony Orchestra. To bring those virtuostic orchestra members together to play as a unit involves the last, but not least element that determines how great a concert experience you will have-the conductor/maestro. Some first time concert goers don't appreciate the importance that the conductor plays. The maestro must be so knowledgable in the composer, in the music of that composer that is before him, and also a knowledge of all the insturments that are being used in the score. While he may only be able to play a few of the instruments, the conductor must nevertheless understand all of the instruments. The conductor is like a football coach who has a certain game plan that gives that team a certain personality. A good coach will also make the talented athletes before him play like a unit. Just like a football coach makes his game plan by looking at the opposing team he is about to play, the conductor determines how a piece will be played by looking at the score of the music and how he thinks [by knowledge of the composer] that composer wants the piece to be played. 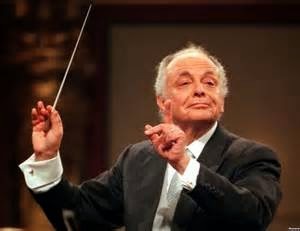 One of those great maestros I would like to highlight today is Maestro Lorin Maazel. Via Wikipedia.com and Lorin Maazel's web site : Maazel was born to Jewish-American parents of Russian origin and brought up in the United States. Lorin Maazel was a child prodigy, taking his first conducting lesson at age seven and making his debut at age eight. At the age of eleven, he guest conducted the NBC Symphony Orchestra on the radio. At twelve he toured America to conduct major orchestras. He made his violin debut at the age of fifteen. He later studied at the University of Pittsburgh. This man is not only brilliant in music, but also in language as he speaks six different languages, three of them fluently. His great career has led him to many places around the world as director/conductor of some of the great orchestras: Cleveland, Vienna, France, Pittsburgh, the Bavarian Radio Symphony, and the New York Philharmonic. Today, at the youthful age of 82 the Maestro is going strong being the chief conductor of the Munich Philharmonic Orchestra. God Bless this great man. May Maestro Maazel continue to conduct the great music of the masters, for many years to come. To learn more about this great man please visit his website here. Here is Maestro Lorin Maazel conducting Beethoven's Egmont Overture. I suggest you turn up the volume and play this video in full screen to watch one of the great conductors of all time. Great conductor! Thanks for this nice blog post! Thanks so much Juniper sky!! Michael, thank you so much for this post! The opening violins gave me goosebumps! He is truly an outstanding maestro. I checked iTunes and was excited to find 50 songs, several albums, and a few podcasts by Maestro Maazel. There is also an iPhone app! I will be downloading several soon. Thank you for reacquainting me with Maestro Maazel. Thank you Joel for that information and for reading and listening to this post. That's what makes it all worthwhile. Great comments Joel!! Amazing music smooth, yet exciting--- so fun to watch the conductor, his passion is palpable-- I'm not a classical expert , but can still enjoy this artistic genius , thanks for posting big mike!